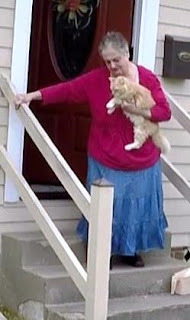 Whenever I get a call for a cat rescue, I start walking to my computer so that I can look up the address on Google Maps. That way, I don't have to ask for directions, since I will be able to see exactly how to get there and estimate how long it will take. This time, however, I did not need Google Maps to show how me to get there, because the caller, Betty, lived only two blocks away from me. This would be a rescue for one of my own neighbors. The cat, named Sugar Baby, is an orange girl who originally belonged to Betty's mother. Betty did not know Sugar Baby's age when her mother got her. She knew only that that was 15 years ago, so Sugar Baby had to be at least that old and probably older. Sugar Baby was not in good health, and she was moving very slowly. 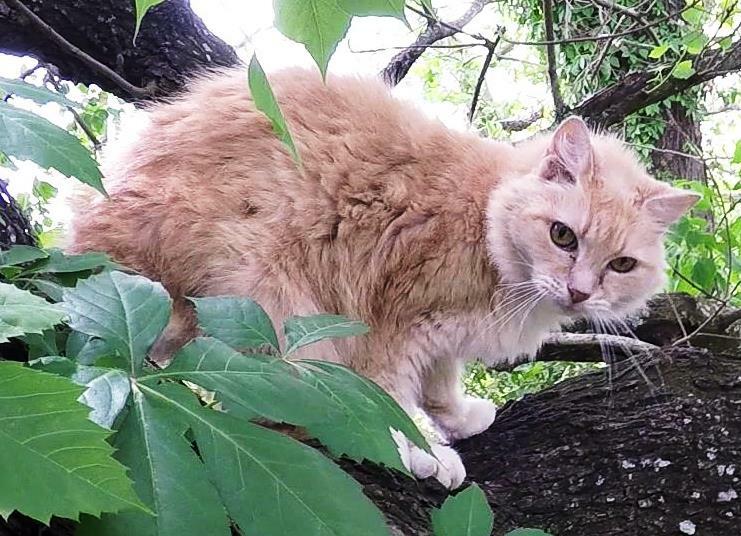 While she is always kept inside, she found an opportunity to dash out the door while it was open, and she ended up 15 feet high in the tree. She had been stuck there for one night before Betty found me and called. The tree that Sugar Baby chose to climb was a very old tallow tree that was tightly squeezed between two fences and two houses, so access was pretty limited. To make matters worse, the tree held several vines, including poison ivy, and it leaned significantly over one of the houses. Sugar Baby was perched where a large branch led in one direction and the trunk leaned in the opposite direction over the house. Because of the lean, there was nothing above the cat that I could use to tie my rope. If I tied my rope to a branch higher up the trunk, I would be hanging too far away from the cat to reach her. To remedy this situation, I installed a second rope in the branch on the opposite side. This way, I could climb the rope installed on the trunk and use the second rope to pull myself closer to the cat. While Sugar Baby is very sweet to her own family, I learned that she is not particularly fond of strangers. Also, her disposition could turn grouchy at times, probably due to the aches and pains that came with her old age. 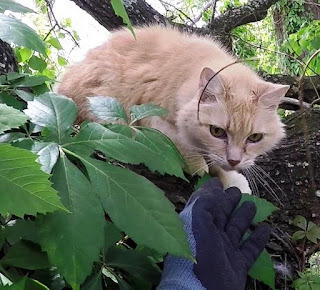 With that information, I was not expecting a cooperative cat, so I was a bit surprised when she remained in place as I approached her and even reached out to me to sniff my hand. With that gesture, I thought she would be friendly after all. My attempts to touch her, however, were not welcomed. Apparently she did not like the scent of my gloves, because she pretty quickly decided that I was no friend of hers. She turned away from me and climbed down to the next branch. 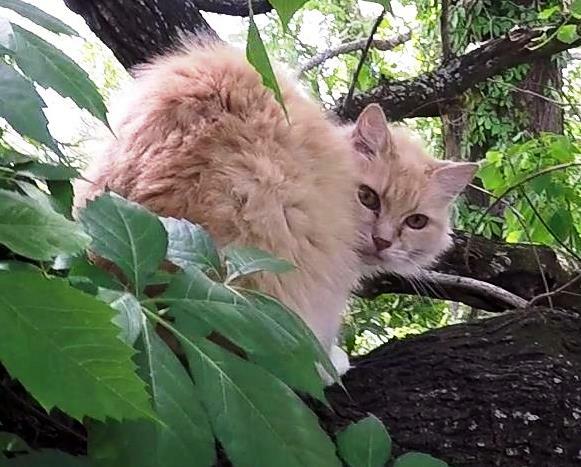 She paused there to look at me again, and then she went down head-first, grasping the trunk with her claws as best she could, and slid down the trunk on her belly to the next branch about 8 feet below. Again she paused there and looked back at me. She was now very close to the ground, but she needed a little more encouragement to proceed with the last eight feet down. I pulled myself over to where it appeared that I was planning to follow her, and that was all she needed. She hung on as best she could and climbed down until she was just two or three feet from the ground. At that point she jumped. When most cats reach the ground in a situation like this, they quickly run off to hide. I don't think that Sugar Baby, however, felt well enough to run. She walked very slowly and went under the house. I figured she would hide there until I left. I came down to the ground, took off my climbing gear, and walked to the front door to let Betty know that Sugar Baby was down and under the house. Betty called for her, and Sugar Baby immediately came out from under the house and walked up to Betty. Betty happily picked her up, and, after expressing her gratitude to me, took her inside. Another happy kitty. Another happy person.